Patricia Martyn-Broyd, now in her seventies, has retired to the Highlands. She hasn't written a word in years and her books are out of print. But now a television company is about to film her last detective story, featuring the aristocratic Scottish detective Lady Harriet Vare. Even better, a London publisher is bringing the book into print. Even though the snobbish Miss Martyn-Broyd doesn't care to mix with the locals she can't help but share her excitement with local policeman Hamish Macbeth. Imagine her horror when Miss Martyn-Broyd discovers that Lady Harriet Vare is portrayed as a pot-smoking hippy, that the screenwriter is known for his violent and scurrilous scripts and that Lady Harriet is going to be played by the scene-stealing trollop Penelope Gates. But a contract is a contract, Ms Martyn-Broyd quickly learns and when she is accused of murdering the scriptwriter and the leading lady, she turns to her one friend in Lochdubh, Hamish Macbeth, to help her. Excellent story, keeps you hanging on to the last! MC Newton keeps you hanging on for Hamish to solve the plot. Poor Hamish, still unlucky in love. Would you listen to Death of a Scriptwriter again? Why? 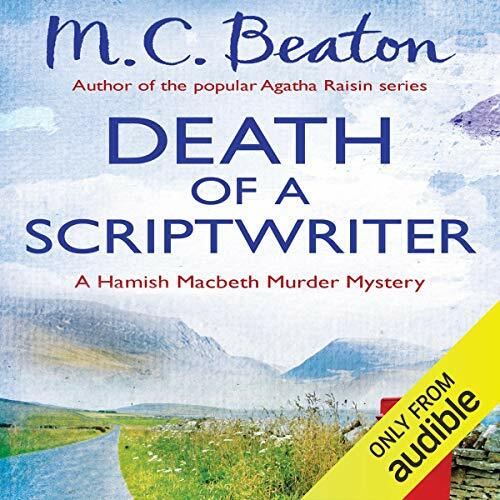 Yes, the whole series following the life of Hamish Macbeth can be listened to over and over again - still as enjoyable however many times I listen. Scriptwriter didn't disappoint. What was one of the most memorable moments of Death of a Scriptwriter? Patricia's mortification at Lady Harriet being portrayed as a fun loving, hippy type was very amusing - I laughed out loud at some of the phrases used. What about David Monteath’s performance did you like? Everything! I tried listening to another of the Hamish stories by a different performer and it just wasn't the same. David brings all the characters to life. Nothing really 'moved me' but, as usual, I found the story light hearted and amusing. Although any of the Hamish Macbeth books can be enjoyed as a stand-alone, I think it would be better to listen to them in order. A good evening listen. It's well written and well read, what more could you want. I will definitely go on to listen to more Hamish stories.